Sometimes, the sub-headline says it all. As the sub-headline suggests, BMW didn’t build the i3–the titular electric car–because it plans on making money. In fact, according to reporting by the Wall Street Journal’s Joseph White, ‘The i3, which starts at €34,950 in Germany, could lose €197 million a year on an operating basis…’ So the car is a loser. BMW’s launch of its new i3 is actually quite instructive on current events. This morning, we reported that newly confirmed EPA administrator Gina McCarthy believes that climate change regulations are an economic stimulus. The i3 is proof to the contrary. Instead of meeting actual demand, BMW is selling the i3 to meet mandates. In the American market, President Obama’s EPA in 2010 established greenhouse gas regulations that effectively require fuel efficiency improvements. The European Union had already implemented the same sort of regulations. 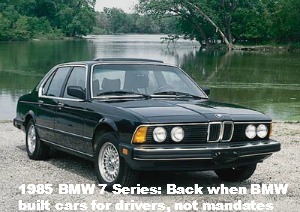 Thus, the international car market has been skewed by the hand of government. BMW, by building the i3, is reacting to this dirigisme. BMW Chief Executive Norbert Reithofer told the WSJ that, “If you look around the world, [at] the emissions regulations, in the United States, in the European Union, even in China…cars like the BMW i3 are a must.” Simply put, the BMW i3 is a real-world industrial response to EPA climate regulations. Yesterday, EPA administrator McCarthy said the President’s climate plan was ‘an opportunity to “bend the curve” and could “fuel the complementary goals of turning America into a magnet for new jobs and manufacturing.”’ As I explained in the previous paragraph, the agency already has “bent the curve” of the auto market, and the result of these market manipulations is a car company that builds a money-losing car for non-existent customer demand. Does this sound like wise economic policy?